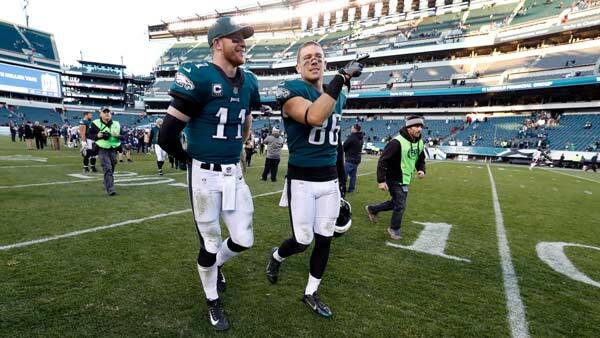 Philadelphia Eagles' Carson Wentz, left, and Zach Ertz walk off the field after an NFL football game against the Chicago Bears, Sunday, Nov. 26, 2017, in Philadelphia. NEW YORK (WPVI) -- The Philadelphia Eagles and New Orleans Saints each placed six players in the game, and Antonio Brown, Le'Veon Bell and Ben Roethlisberger are among a Pro Bowl-high eight Pittsburgh Steelers selected for the all-star game, to be played Jan. 28 in Orlando, Florida. Congratulations to the six #Eagles named to this year's Pro Bowl roster! Four rookies were chosen in voting by NFL players, coaches and fans: running backs Alvin Kamara of the Saints and Kareem Hunt of the Chiefs, cornerback Marshon Lattimore of the Saints, and safety Budda Baker of the Cardinals. Twenty-four of the 86 Pro Bowl selections announced Tuesday are newcomers.